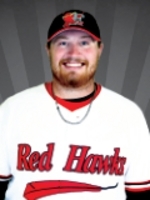 The RedHawks signed Gregory as a free agent on May 29, 2018. Gregory played college baseball at St. Cloud State University before turning pro. He played the last two seasons with the River City Rascals of the Frontier League. In two seasons with River City, he went 11-8 with a 4.88 ERA in 37 games (15 starts). In 155 innings of professional baseball prior to this season, Gregory has struck out 96, walked 39 and given up 92 runs.